Everything decays, and yet God and His word endures. Yes, I'm combining the two verses. I saw the verse Jeremy Camp posted up and I thought, "Hey, that's such a great word." On the one hand, since everything is replanted to the earth, even our own bodies, we decay more and more as time passes on. It's inevitable. It wasn't supposed to be like this. Don't get me wrong. I'm as positive as the next Christian. For those of us who belong to Him who saves we see death (it's a barrier) as a thin glass that we pass through, so that kind of decay is something we will go through, due to what Adam did. 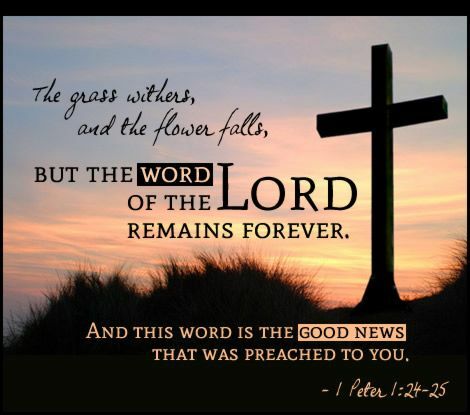 But, there is good news indeed: Christ came and gave His life so we might have life. Yes, we may decay and die, but surely when we call on His name - Jesus Christ - in the bottom most part of where we are, He can and will save us from ourselves and our sin. He takes us out from the pit, setting us on a firm rock. That rock is only found in Him. So, even though we still pass through the veil of death, it holds no power over us just as it had no power over Christ. Today's word is a good word for sure. I truly hope this blesses you today in our Lord Jesus Christ. Amen.